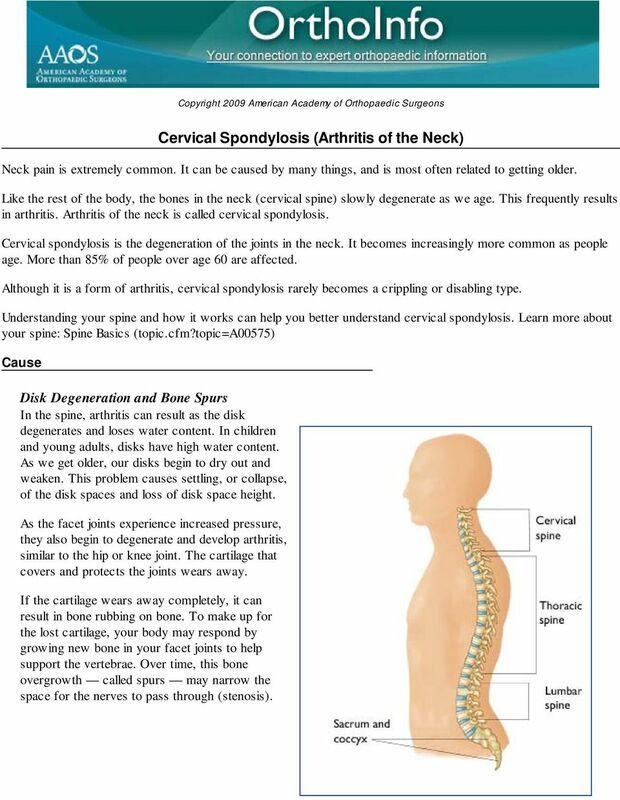 Download "Cervical Spondylosis (Arthritis of the Neck)"
1 Copyright 2009 American Academy of Orthopaedic Surgeons Cervical Spondylosis (Arthritis of the Neck) Neck pain is extremely common. It can be caused by many things, and is most often related to getting older. Like the rest of the body, the bones in the neck (cervical spine) slowly degenerate as we age. This frequently results in arthritis. Arthritis of the neck is called cervical spondylosis. Cervical spondylosis is the degeneration of the joints in the neck. It becomes increasingly more common as people age. More than 85% of people over age 60 are affected. Although it is a form of arthritis, cervical spondylosis rarely becomes a crippling or disabling type. Understanding your spine and how it works can help you better understand cervical spondylosis. Learn more about your spine: Spine Basics (topic.cfm?topic=a00575) Cause Disk Degeneration and Bone Spurs In the spine, arthritis can result as the disk degenerates and loses water content. In children and young adults, disks have high water content. As we get older, our disks begin to dry out and weaken. This problem causes settling, or collapse, of the disk spaces and loss of disk space height. As the facet joints experience increased pressure, they also begin to degenerate and develop arthritis, similar to the hip or knee joint. The cartilage that covers and protects the joints wears away. If the cartilage wears away completely, it can result in bone rubbing on bone. To make up for the lost cartilage, your body may respond by growing new bone in your facet joints to help support the vertebrae. Over time, this bone overgrowth called spurs may narrow the space for the nerves to pass through (stenosis). 3 anything make it better or worse? Were you ever involved in an accident or had an injury to your neck? Have you ever been treated for your neck pain? A thorough physical exam will include your neck, shoulders, arms, and frequently your legs, as well. Your strength, touch sensation, reflexes, blood flow, flexibility of your neck and arms as well as your walking may be tested. The doctor may press on your neck and shoulders, and feel for trigger (tender) points or swollen glands. Tests Your doctor may supplement your evaluation with blood tests, and, if necessary, consult with other medical specialists. 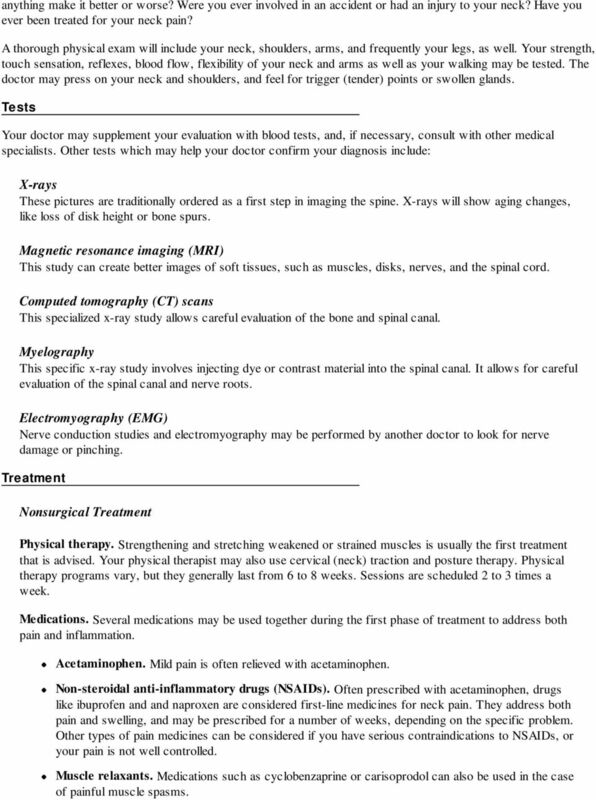 Other tests which may help your doctor confirm your diagnosis include: X-rays These pictures are traditionally ordered as a first step in imaging the spine. X-rays will show aging changes, like loss of disk height or bone spurs. Magnetic resonance imaging (MRI) This study can create better images of soft tissues, such as muscles, disks, nerves, and the spinal cord. Computed tomography (CT) scans This specialized x-ray study allows careful evaluation of the bone and spinal canal. Myelography This specific x-ray study involves injecting dye or contrast material into the spinal canal. It allows for careful evaluation of the spinal canal and nerve roots. Electromyography (EMG) Nerve conduction studies and electromyography may be performed by another doctor to look for nerve damage or pinching. Treatment Nonsurgical Treatment Physical therapy. Strengthening and stretching weakened or strained muscles is usually the first treatment that is advised. Your physical therapist may also use cervical (neck) traction and posture therapy. Physical therapy programs vary, but they generally last from 6 to 8 weeks. Sessions are scheduled 2 to 3 times a week. Medications. Several medications may be used together during the first phase of treatment to address both pain and inflammation. Acetaminophen. Mild pain is often relieved with acetaminophen. Non-steroidal anti-inflammatory drugs (NSAIDs). Often prescribed with acetaminophen, drugs like ibuprofen and and naproxen are considered first-line medicines for neck pain. They address both pain and swelling, and may be prescribed for a number of weeks, depending on the specific problem. Other types of pain medicines can be considered if you have serious contraindications to NSAIDs, or your pain is not well controlled. Muscle relaxants. Medications such as cyclobenzaprine or carisoprodol can also be used in the case of painful muscle spasms. 4 Soft Collars. These collars limit neck motion and allow the muscles of the neck to rest. Soft collars should only be worn for short periods of time because long-term wear can decrease the strength of neck muscles. Ice, heat, other modalities. Careful use of ice, heat, massage, and other local therapies can help relieve symptoms. Steroid-Based Injections. Many patients find short-term pain relief from steroid injections. Various types of these injections are routinely performed. The most common procedures for neck pain include: Cervical epidural block. In this procedure, steroid and anesthetic medicine is injected into the space next to the covering of the spinal cord ("epidural" space). This procedure is typically used for neck and/ or arm pain that may be due to a cervical disk herniation, also known as radiculopathy or a "pinched nerve." Epidural injection in the cervical spine. 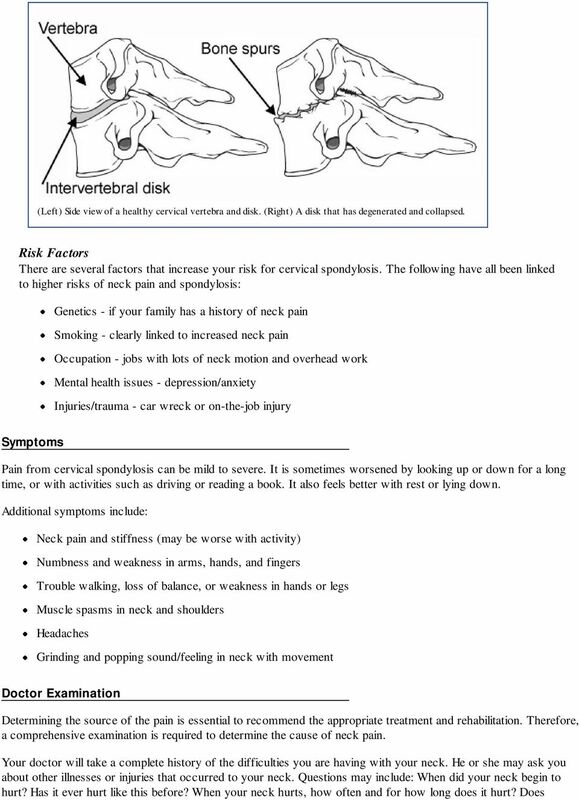 Cervical facet joint block. Steroid and anesthetic medicine is injected into the capsule of the facet joint in this procedure. The facet joints are located in the back of the neck and provide stability and movement. These joints can develop arthritic changes that may contribute to neck pain. 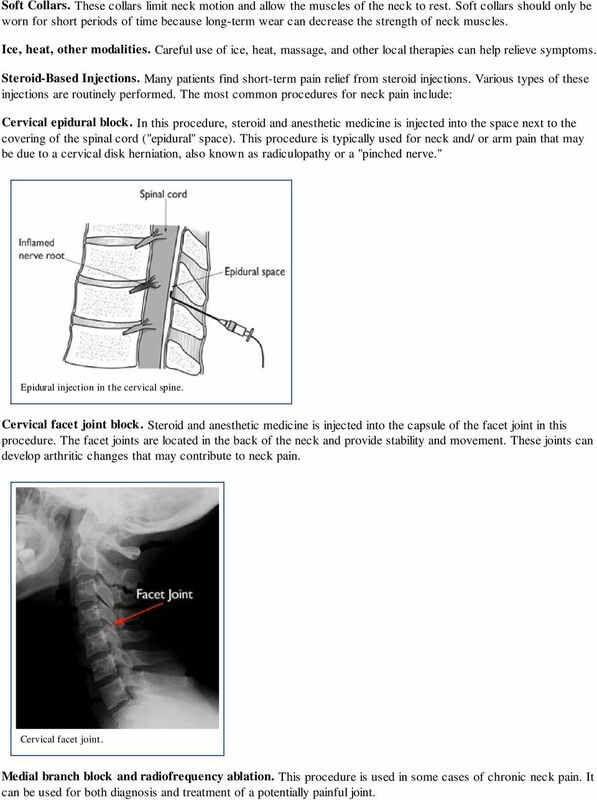 Cervical facet joint. Medial branch block and radiofrequency ablation. 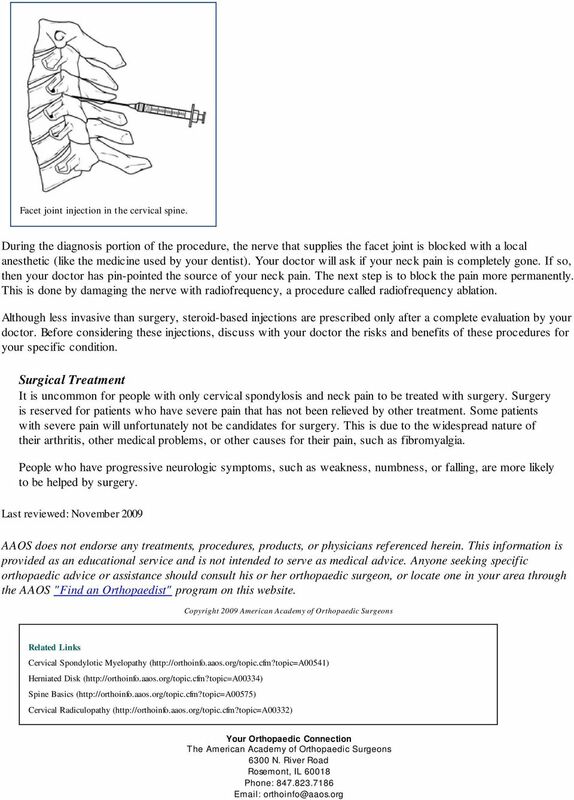 This procedure is used in some cases of chronic neck pain. It can be used for both diagnosis and treatment of a potentially painful joint. SPRING 2015 AWISH. 750 Dawson Ave, #103 Dorval, QC H9S 1X1 Tel: 514-631-3288/Fax: 631-9484 arthritis@awishmontreal.org www.awishmontreal. world-class orthopedic care right in your own backyard. Arthritis of the Shoulder In 2011, more than 50 million people in the United States reported that they had been diagnosed with some form of arthritis, according to the National Health Interview Survey. .org. Achilles Tendinitis. Description. Cause. Achilles tendinitis is a common condition that causes pain along the back of the leg near the heel. Are You Living with. Knee Pain? MAKOplasty may be the right treatment option for you. SPINAL STENOSIS Information for Patients WHAT IS SPINAL STENOSIS?